Attached character gains the King trait. Attached character gets -4 STR and is killed if its STR is 0. The Road to Winterfell #34. 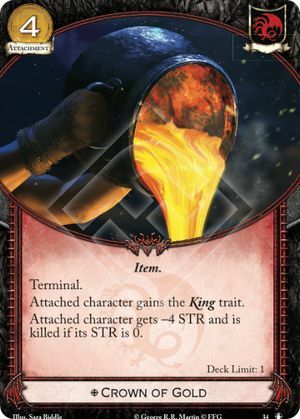 If my opponent tries to kill my character with Crown of Gold, can I use an "Action" effect to boost the character's strength and save it? No. Marshaling Crown of Gold and using something like Lady or Margaery are both "actions", which are taken in alternation between players and resolved fully before the next one can happen. If your opponent marshals Crown of Gold and you don't have a way to "interrupt" it (like a save that also gets your character out of the 0 str range, like Risen from the Sea), then they'll die when it resolves. After that, there's an opportunity to react to its use (e.g. Joffrey, reacting to the death), but that won't change what happened. Once all reactions are passed on, you move on to the next player's action. In the case of Lady or Margaery, it's far too late. Can a duplicate or Bodyguard save from Crown of Gold? No. RRG pg 19: If a constant ability or lasting effect imposes a condition upon a card that would continually drive it from play (for example, a lasting effect that applies to a character over a period of time, and kills that character if its STR is 0), any attempt to save the card must also remedy the ongoing condition. Otherwise, upon resolution of the save attempt, the card is immediately re-exposed to the ongoing condition, and removed from play. Therefore, if the save effect does not also remedy the ongoing condition, it cannot be initiated, as the effect has no potential to change the game state. As such, using a duplicate to save from such an ongoing condition is also prohibited.